Will Write for Food is for food lovers who want to express themselves, guiding them from their earliest creative impulses to successful article writing, restaurant reviewing, and cookbook writing. Dianne Jacobjournalist and food-writing instructor and coachoffers interviews with award-winning writers such as Jeffrey Steingarten, Calvin Trillin, Molly O'Neill, and Deborah Madison, plus well-known book and magazine editors and literary agents, give readers the tools to get started and the confidence to follow through. Comprehensive yet accessible chapters range from restaurant reviewing to cookbooks to memoirs. Focused exercises at the end of chapters stimulate creativity, help organize thought, and build practical skills. 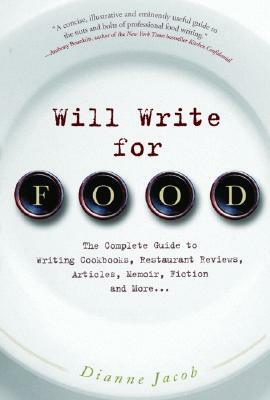 Will Write for Food is the first and ultimate ins and outs guidebook to the incredibly popular world of food writing.